This database provides doctoral dissertations submitted to Kyoto University or, its predecessor, Kyoto Imperial University. Each record includes a request code, the date (year, month, date) of doctorate degree conferral, the doctorate degree number, the name of the author and its reading, the title in the text language, and titles in other languages. Use the search window at the top of this webpage or our KULINE system. * Please note that search results may differ between the two methods. 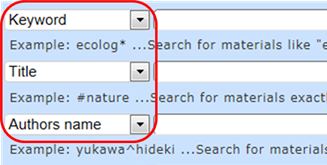 Type in a title, author(s) and/or keyword(s) in the search field and click [Search]. Visit KU Libraries Online Catalog (KULINE) webpage. Enter a keyword or keywords and click [Search]. * The search results include books, magazines, digital books, digital journals and other publications that match the search criteria in addition to doctoral dissertations. In order to extract doctoral dissertations only, click on “Dissertations” displayed under Material Type in the Refined Search pane. (1) Visit KU Libraries Online Catalog (KULINE) webpage. 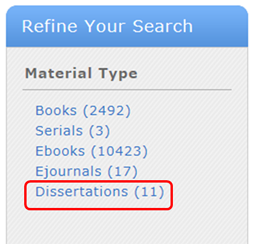 (3) Check the “Dissertations” checkbox for Material Type. (4) Search by keyword(s), title or author. Enter the appropriate information and click [Search]. Kyoto University Library archives all the doctoral dissertations submitted to Kyoto University since its establishment in 1897. Doctoral dissertations are treated as rare materials in Kyoto University Library, and as such, they require prior application in writing (designated application form). The service is available on weekdays 9:00 through 11:45 and 13:00 through 16:45, and not on Saturdays, Sundays and national holidays. Some doctoral dissertations may be archived at different locations other than Kyoto University Library. Please read the following for details of availability and conditions of use (jpn only). The data for dissertations submitted from March 1958 to March 1988, since May 1998 also includes the abstract. If you have already obtained a doctorate degree and are willing to publish the full-text of your dissertation in the Kyoto University Research Information Repository (KURENAI), please read How to deposit your article in Kyoto University Research Information Repository (KURENAI) and contact us.